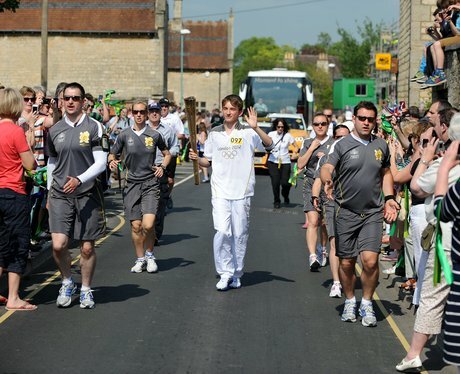 On Wednesday 23rd May 2012 my home town of Cirencester welcomed the Olympic torch relay to our town,I have never seen so many people gather in the town to welcome the Olympic torch and with it the Olympic spirit, I was able to skive of work for fifteen minutes to watch this highlight of Cirencester's year, or is it with the Diamond jubilee approaching and lots of events planned for this celebration.I was going to waffle on about Cirencester and events in history that made this town but I guess if you want to find out about my town you can do so by following the links above. So to commemorate this event I came up with this recipe Chocolate Olympic Torch with (Ginger and Cardamom Cream) this recipe is also a very light summer dish and like the torch a bit fiery so I hope you will let me know your thoughts if you try this. 1.Place a sheet of baking parchment on 2 baking trays (cookie sheets). Lightly grease 6 cream horn moulds (molds). To make the horns, beat the egg white and sugar in a mixing bowl until well combined. Sieve (strain) the flour and cocoa powder together, then beat into the egg followed by the melted butter. 2.Place 1 tablespoon of the mixture on to 1 baking tray (cookie sheet) and spread out to form a 12.5 cm/ 5 inch circle. Bake in a preheated oven, 200oC/ 400oF/ Gas Mark 6, for 4-5 minutes. 3.Working quickly, remove the biscuit (cookie) with a palette knife (spatula) and wrap around the cream horn mould (mold) to form a cone. Leave to set, then remove from the mould (mold). Repeat with the remaining mixture to make 6 cones. 4.Melt the chocolate and dip the open edges of the horn in the chocolate. Place on a piece of baking parchment and leave to set. 5.To make the cardamon cream, place the cream in a bowl and sieve (strain) the icing (confectioners') sugar and ground spices over the surface. Whisk the cream until standing in soft peaks. Fold in the chopped ginger and use to fill the chocolate cones. The only tip I can give you is work as fast as you can maybe to give you a bit more time leave the baking tray on top of the stove to maintain the heat as long as possible. Chocolate coins were first developed for Queen Marie Antoinette to ease her distaste for taking medicines. To solve this problem and since chocolate was considered a medicine at the time, the royal family chemist, Sulpice Debauve, developed chocolate coins made of cocoa, cane sugar, and medicine mixed together.